Though there are many different styles and sizes of chicken housing, they all fall into one of several main categories: mobile, stationary and what I will call semi-mobile (or semi-portable). Let’s look at each of these in more detail. Mobile chicken housing is housing that’s meant to be moved (and that’s built in such a way that it’s easy to move). Mobile chicken coops can range from small chicken tractors easily moved by hand, with a capacity of only a few hens to large houses able to contain several hundred chickens. Larger mobile coops may require a tractor or other motorized vehicle to move them. Mobile coops are usually open on the bottom to let the chickens have full access to the earth beneath them, so they can scratch, peck, eat small bugs and insects, find weed seeds, take dust baths and eat grass. Stationary chicken coops are not made to be moved. These can be separate outbuildings are partitions built inside of a larger structure, such as a barn. Stationary coops typically have a solid floor made of wood, block or concrete. Stationary coops may have an attached chicken run that gives the chickens some access to the outdoors and contact with the ground. Semi-mobile housing lies between these two extremes and refers to coops that can be moved, but that are designed to be left in a single location for weeks or months at a time. An example would be a shed-style coop built on skids that can be pulled by a tractor or vehicle. Which Type of Coop Is Best? The answer to that really depends on a number of factors. There’s no single best coop for every situation, every homestead and every management style. The amount of available pasture, the number of chickens that you need to house, the time and flexibility that you have to move coops or to care for your chickens all factor in question of which coop is best. With a small flock and plenty of pasture land, my preference in most situations is to use a mobile chicken coop. The main reason is that they are very versatile and easy to integrate into the rest of your farm or homestead. For example, if you’ve recently finished harvesting all the tomatoes in your vegetable garden, you can put chickens in a mobile coop in your garden area to help cleanup the leftovers from that crop, to eat bugs and to fertilize the area for the next crop. Chickens can also be used to graze down a cover crop, converting it into manure that will benefit your soil. 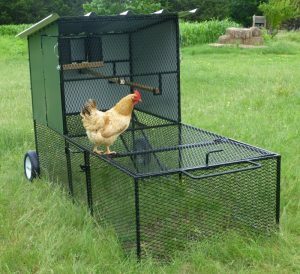 On pasture or lawn, chickens in a mobile coop can be rotated from one spot to another to fertilize and graze the grass and lightly aerate the soil. So one of the key advantages of portable coops is their versatility. Second, they are easy to keep clean, which helps the health of your flock. Since the floor of the mobile coop is the soil or pasture, every time the floor begins to be covered with manure, simply moving the coop puts your chickens on fresh, clean soil. In my Black Australorp breeding flocks, I like to move the 10′ x 10′ hoop coops that I house them in every 2 days. Moving the coop regularly also helps to eliminate and prevent problems with parasites, such as worms, since the chickens are not staying in one place long enough for the parasite to go through its reproductive cycle. One of the downsides of a portable coop is that they are always somewhat of a design challenge. They need to be light enough to move, heavy enough to discourage predators from digging under, sturdy enough to last, and in the case of larger structures that contain a large “wind area,” heavy enough to stay on the ground even in high winds. It’s always possible to design something that will work, but the mobile requirements place additional design constraints on the coop. Next, keeping out predators that can dig well is a bit of a challenge with a mobile coop on sandy soils. The way to manage that is either to add materials around the coop to discourage digging and/or move the coop frequently enough that nothing has time to dig under. On heavier clay and clay loam soils, this is much less of a problem, though it’s still important to examine the perimeter of your coop daily to see if anything has tried to dig under. Last, when the weather is wet and rainy standing water can be a difficulty because the floor of the coop is the ground. Once the ground becomes fully saturated, water has nowhere to go, and it can tend to pool up in low spots on the coop floor. To avoid having my chickens standing in water, what I’ll normally do in this case is cover the floor with several inches of hay or straw. This gives the birds a dry place to stand and gets them up and out of the water. In dealing with digging predators, standing water and sturdiness, stationary coops excel. They can and should be built well above grade so they are not subject to pooling or flooding problems during heavy and extended rains. Because you aren’t trying to make them portable, they can be as heavy and sturdy as you would like, and can be anchored securely to withstand high winds. As mentioned previously, they generally have a floor — ideally one that is impenetrable to predators. If you have limited land available on which to raise your chickens, a stationary coop provides a place where you can capture their manure rather than let it fall directly on the soil. For this purpose, I recommend using the deep litter or deep bedding approach, with which you allow 8 inches up to a foot of bedding to accumulate on the floor of the coop. An ideal bedding is pine shavings. We like using those made by “Sun Coast”. By maintaining the proper carbon to nitrogen balance in the deep bedding, the bedding acts as a compost heap on the floor of the coop and helps to decompose new manure relatively quickly, keeping smells to a minimum and providing a healthy floor and environment for your chickens. The downside to stationary coops is that they don’t move. So your chickens are in the same place all the time. This can lead to increased difficulties with parasites. Second, because the coop never moves, grassy runs or “grazing areas” that the chickens have access to usually quickly become bare dirt. Even those that don’t may have the chickens’ favorite plants grazed out of them soon because those plants aren’t ever given a rest and recovery period during which they can regrow without being eaten. Third, in the run area, unless it is movable, manure eventually builds up to sufficient levels that vegetation can no longer thrive there. Which Type of Coop Do You Recommend? If you don’t have much time or aren’t available to move your coop regularly, then I’d recommend going with a stationary coop. Otherwise, I recommend a portable coop. If you have lots of chickens for the amount of land that you have, I’d recommend a stationary coop. If you have plenty of pastureland, I recommend a portable coop. If you have problems with frequent flooding, either because of excessive rainfall or because your property is flat and water has nowhere to drain, then I’d lean toward a stationary coop. If draining is only rarely a concern, then I would use a portable coop. If you have sandy soil and anticipate that you will have trouble with predators digging under your coops, I’d recommend a stationary coop with a secure floor made of wood, concrete or concrete block. Otherwise, I would recommend a portable coop.